Summer is coming, slowly but surely (I promise) and Costa Coffee “The Nation’s favourite coffee shop” is making the Summer feel even better! Having launched their “Seriously Summer” campaign, stores around the country have been decorated with bright colours and have a new Summer menu… Have you tried their ‘Green Tea, Lime & Mint Fruit Cooler’? Delicious! 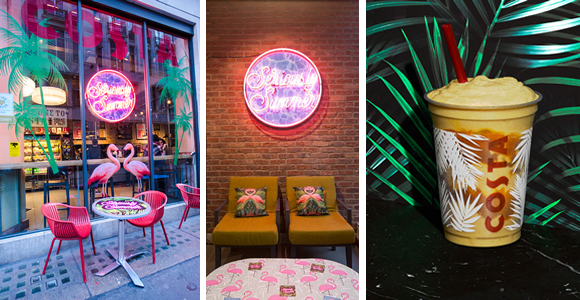 Three Seriously Summer stores have even dedicated “selfie zones” to the Miami theme where consumers are able to take a Summer selfie whilst enjoying a coffee break… Amazing! The Miami style décor that is present throughout the stores consists of neon signs, bright coloured cushions and tropical plants. Emphasising the thought that you are genuinely in Florida rather than the UK… No need to fly out to the States to get that sense of Summer this year! The baristas have also been given new uniforms to blend into the stores. The new shirts have been designed and supplied by fashion entertainment site Refinery 29. Costa, realising the importance of the obligatory selfie for the younger generation has also dedicated “selfie zones” in 3 of their stores. The branch stores can be found in London, Leeds and Glasgow and they have designated areas where customers are able to show off their award winning pouting skills with the illusion of them sitting on a beach. 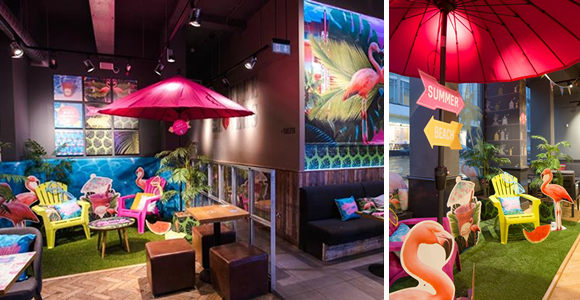 The selfie zones are made up with the use of fake grass, parasols, bright lounge chairs and flamingo cut outs. Props such as oversized sunglasses can be used by the Snapchat models to add an element of fun to their Summer photos. It is almost like being somewhere completely different and I am sure that the background will be enough for your friends to get confused about where you could be! You’ll love it! When uploading onto social networking sites such as Facebook and Twitter, consumers are encouraged to add the hashtag #seriouslysummerselfie to their post. Adding the hashtag to their post will enter them into a competition where they have the chance to win a Seriously Summer piece of merchandising. I have my eye on one of the flamingos! The use of the hashtag is also a great technique to attract maximum exposure for the coffee brand and what better time to do this than during the summer season?! I am pretty inspired by this technique, might have to take a similar idea to the MD and talk about doing something similar here at Café Reality, maybe bring in an inflatable pool! I wasn’t joking about wanting one of the flamingo cut outs, so if I manage to visit one of the stores (we have upto the 27th of June) I promise that I will load up a selfie for you guys… Watch this space!